Discount rates guarantee with "Like Us" on Facebook. Book online,instant confirmation, price % off. 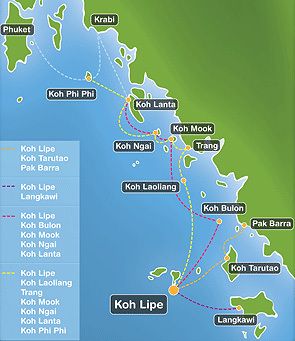 Koh Lipe is 60km from the nearest Thai port, Pak Bara, and 40km from Langkawi.. The easiest way to get to Koh Lipe is from either Pak Bara or Langkawi during the high season.The high season is from early November to late April and there are speed boats and ferries connecting Koh Lipe with all the islands and areas up and down the coast including:Langkawi, Koh Lanta, Krabi, Koh Phi Phi and Phuket. From November unti May is is possible to travel from Koh Lipe to Phuket, withouth ever setting foot on the mainland. Koh Lipe is slowly evolving to an all year destination with daily ferries from Pak Bara;this is the main hub for ferries and speedboats to Koh Lipe. Since 2013 there are 2 daily connections in Low Season:11.30 and 12.00. From November until May up to 8 boats go back and forth between Koh Lipe and Pak Bara starting 11.30 every 1 hour and last is 16.00 . There is no pier on Koh Lipe : when you arrive in Koh Lipe the speed boat or ferry will stop offshore on a floating pier outside the coral reef.